Happy Pongal Date 2019 in India is a Tamil harvest festival. It is celebrated to thank the Sun God for the harvest they yield. It is also known as Thai Pongal and is a festival that lasts for four long days. This festival is one of the most important ones for the Tamilians and is celebrated in Tamil Nadu, the Indian Union Territory of Puducherry, and the country of Sri Lanka, as well as the Tamils in the other part of the world, including the ones staying in Malaysia, Mauritius, Singapore, UK, South Africa, United States, Canada, etc. Thai Pongal usually falls on the 14th or 15th of January every year. It is the date on which Makara Sankranthi is celebrated. Thai Pongal is the same as that of the Makara Sankranthi festival which is celebrated by the Hindus in India. The day marks Uttarayan; the start of the sun’s six-month-long journey towards the north. At this phase, the sun is assumed to be entering the 10th house of the Indian Zodiac ‘Makara’ which is also called ‘Capricorn’. 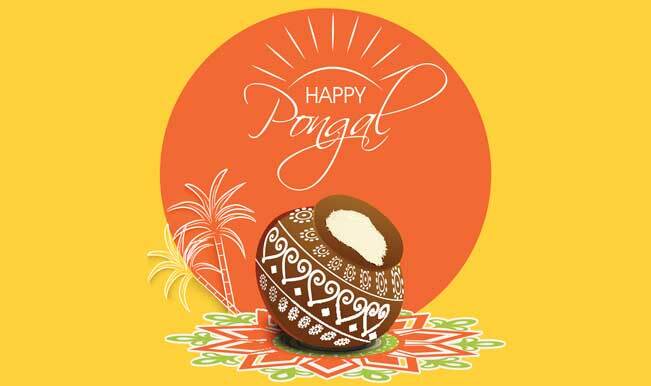 Thai Pongal is basically celebrated to appreciate the Sun God for a successful harvest. Day 1: The first day is observed as the Bhogi festival. On this day the Tamilians worship Lord Indra, the God of the rains. The people pay homage to the Lord Indra for appreciating for the harvest they yield and to get prosperity to the land. On this day a ritual is followed known as Bhogi Mantalu, in which the people make a bonfire and throw their useless household articles in it. Girls, in order to praise the God dance around the bonfire and sing traditional songs. This ritual is the same as that of Holi festival, in which the people make a bonfire and praise the lord. Day 2: On the next of Thai Pongal, people arrange a puja in which they cook rice in milk in earthenware. To this earthenware pot, a turmeric plant is tied, which is part of the ritual. This is offered to the Sun God along with other offerings. The offerings consist of sugarcane sticks, bananas and coconuts as well. People are seen dressed up in traditional attires. Are ritual is followed on this day wherein married couples discard the utensils used in the rituals or pujas. A special attraction of this festival is the design of the lime powder that is made early morning around the house by the women living in it. Day 3: The third day called the Mattu Pongal is for the cows, they are appreciated for they provide milk, fertilizer and also help the farmers in farming (plowing). The farmers bathe their cattle and decorate them with beads of different colors, bells, and flower-garlands are tied around the neck of the cows. They are fed with Pongal and are worshipped. The men take their cattle to the village centers. The sweet tinkling of the bells tied to the cows’ neck, attract the villagers. The atmosphere in the village is filled with festive joy. Day 4: The fourth day known as the Kaanum Pongal is the fourth and the last day of Pongal festival. The word Kaanum means ‘to pay a visit’. Many people gather together with their relatives in order to celebrate this last day of Pongal. They offer gifts to each other and distribute sweets as well, showing love towards each other. Brothers offer special gifts to their married sisters in order to show their utmost affection towards them. Villagers go visit their relatives. The people living in cities move out for an outing with their families and friends and celebrate this day there itself. Many Tamilians reside in the other part of the world. They are seen in many numbers in the countries like the U.S., U.K., Africa, Australia, South East Asia, Gulf Countries, Europe, etc. Various rituals are followed for celebrating the Pongal festival. In Mauritius, where around more than 2.5 lakh Tamilians reside together, consists of about 250 temples where even today those old time rituals are followed during the various festivals. The Tamils living over there have great pride and honor towards their traditions. The Pongal festival is one of the major ones celebrated over here and it is also known to be a national fest as well. Australia holds a population of 30,000 Tamils, and these are widespread over all of the six states of this country. Most of the Tamilians are seen staying in the New South Wales and Victoria. There are 10-15 Hindu temples present in the Australian states all over. So the Tamilians residing here celebrate the Pongal festival very joyfully. Even New Zealand has a lot of Tamils, i.e. around 3,000. There are few temples in New Zealand, but the Tamils living over there are planning to build more. In Fiji, 80,000 Tamilians are present at the date. Here the practices to celebrate the Pongal festival are a bit different than the ones followed in India, but the people celebrate it with the same amount of enthusiasm. In the GULF region, Bahrain is the home for Tamils holding about 7,000 Tamilians at present. From there, the people are mostly professionals or workers. There are about 5,000 Tamils right now, whereas in the UAE nearly 10,000 Tamilians are seen residing for many years. These are the ones who have shifted from Tamil Nadu and mostly Sri Lanka. The harvest festival Pongal corresponds to the celebration of Makara Sankranthi. On the same day, the festival of Lohri and Pongal celebrated in India. Both come together. It is a great festival for harvesting. It brings happiness and enthusiasm for the farmer because it plays the important role of the producer for their agriculture.